Originally from Germany, saxophonist Ingrid Laubrock has spent a good deal of her career in England working in idioms ranging from Brazilian jazz to postbop. Since relocating to Brooklyn, she’s established a reputation as a free improviser. She released the notable Sleepthief (Intakt, 2008) to some substantial acclaim. Her individuality and thoughtfulness are much in evidence on these discs, from moments of quietly energized lyricism to visceral multiphonics. As different as the conceptions are, Laubrock keeps her distinctive personality intact. 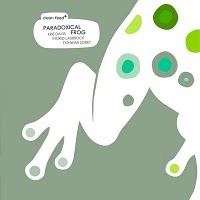 Paradoxical Frog, with drummer Tyshawn Sorey and pianist Kris Davis, emphasizes minimalist and structuralist tendencies. Sorey and Davis contribute three pieces each and Laubrock two and for the most part they’re definitely compositions. Though notes may be chosen at will, their inner workings are often structured. Davis’ “Feldman” – undoubtedly dedicated to composer Morton – begins with isolated gestures from every instrument. Sudden random splashes from the keyboard, muffled drum strokes and airy saxophone phrases gradually coalesce into dense group play only to cede suddenly to a quiet theme from piano and saxophone that gradually creates a feeling of suspended animation and quiet beauty. The Feldman impulse is apparent, too, in Sorey’s composition “Homograph”, a tense alternation of piano and tenor notes that gradually increase in duration and is so insistently composed that the composer doesn’t play on the track. While this sparse methodology can build extraordinary degrees of tension or grace, there are also turbulent moments of real energy, as in Laubrock’s title piece, made all the more memorable by the CD’s striking contrasts. 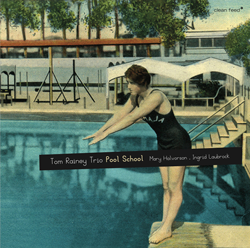 Drummer Tom Rainey has been a mainstay of many bands, working extensively with Tim Berne and Mark Helias. Pool School is his debut as a bandleader, but what it demonstrates most strongly is his sense of the collective spirit of the music, engaging two forceful younger musicians in continuous intense interplay. While there seem to be some themes here (everything is collectively composed, usually the mark of free improvisation), they’re handled in the loosest way. Laubrock’s beautifully deliberated wanderings on “Home Opener” maintain their independence against guitarist Mary Halvorson’s insistent, spiking counter-lines and Rainey’s random punctuations while “Semi-Bozo” begins with light, high-speed figuration that suddenly intensifies and explodes. Rainey’s developed sense of dynamics generates many of the session’s most compelling moments, for example matching quietly urgent tom-toms against Laubrock’s light, high-speed runs on the title track. Laubrock is a player of real resource, pulling new material out at will here (there’s some madly chirping soprano on “Coney” and duck-quack on “Crinkles”) and she’s a fine match for Halvorson, who finds new things to do on every session, and Rainey, a drummer so intuitive he can sound locked-in on patterns that are still coalescing.